The system has different access panels with different actions for each one. Parents or caregivers besides communication, will have reports and information of child at any time. And they can modify the child 's profile..
Dashboard with the information of the amount of children, parents, classes, teachers or caregivers. Management activities and meals of the kindergarten or Day Care, for parent’s visualization and automatic reminding notice for them. Management of Children, Classes, Parents, Teachers of Caregivers. Allows to send newsletters to parents. Report of parent’s system access and if the parent receives the newsletter and open it. Viewing assignation of children and/or the entire kindergarten. Instant message to parent’s in case of accident, symptom of diarrhea/vomiting or fever. Baby bottles registration, meals and snacks. Diaper change (either urine or feces) and the system deducts inventory atomically. Allow to stablish the communication between teachers/caregivers and parents, with full history. Inventory control of essential child items (diapers, towels, cream) and add additional inventories. 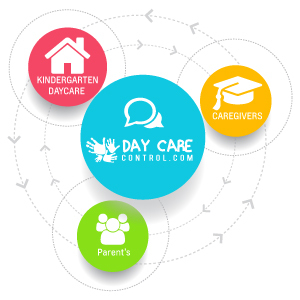 It allows teachers/caregivers to perform activities of each child in an efficient manner, because the kindergarten/Day Care or parent’s setup the actions with a specific time and the teacher/caregiver have only to follow up and mark as applied. It shows if you have a message from a parent of others teachers/caregivers that needs to be known by other people. Dashboard with the full information of the child like: next kindergarten activities, communications, daily report (diapers change, sleep time nap, meals, medication and others), class information and teachers/caregiver assigned. The kindergarten/day care receives a notification alert in case that the parent needs that the child must leave earlier or be absent for a few hours. Show activities, meals and other important information. Full details on the reports of meals, naps, inventory and dippers-change reports. You can write a message and receive messages from the teachers/caregivers, and parents notice when they read it. Full history of all the newsletter. Child information and parents can add a medication that the child requires. The parent can modify the meal information, baby bottles and authorized persons can allow to pick up the child. If the kindergarten has a device, the system will request the parent PIN and will show the Teacher/Caregiver that receives the child and if the child is inside of the institution, it request the Teacher/Caregiver PIN and it will show the Parents or Authorized person to pick up the child. If the kindergarten has a device, the system will request the bar code and will show the Teacher/Caregiver that receive the child and if the child is inside of the institution, it request bar code and it will show the Parents or Authorized person to pick up the child.